The Swim England Water Polo Assistant (Coaching) course is designed to develop the knowledge, skills and abilities needed to be a Water Polo Assistant Coach. 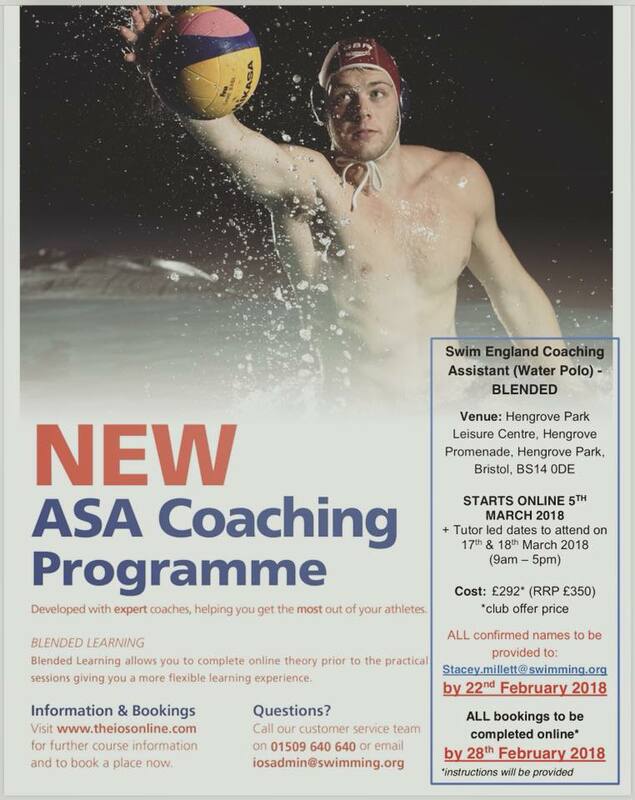 The course is for anyone who wants to take the first step to becoming a Water Polo coach or those interested in supporting a Water Polo coach in a club environment. As an aspiring coach, this course will equip you with the knowledge and tools to actively support a more experienced Water Polo coach, in the delivery of a pre-prepared session. You will be asked to provide formal photographic identification on the first face to face day of your course. Click for more information. This is a Blended Learning programme which means that learners complete part of the theory units online, this work is assessed and then learners complete all e-learning elements prior to attending the face-to-face practical units at Hengrove Park Leisure Centre. 6 - 8 hours of online learning covering the theoretical elements of the course. You will be expected to complete the online learning and undertake an online assessment before attending the course. You will need access to a computer / tablet and Internet access to complete your online learning. Click here for more information about system requirements. * Please contact Stacey Millett, Swim England Club Development Officer (stacey.millett@swimming.org) by 22 February 2018 if you or your club are interested in booking onto this course, wish to take advantage of the Club Offer or require further details. Bookings for this course close on 4 March 2018. You will be able to begin your online learning from 5 March 2018. You will receive an email with details of how to begin this on or before 4 March 2018. You will have until 48 hours before the first face to face date to successfully complete your online learning. Please read carefully through the all the details on this page so you know what this course entails. Download poster for Club Notice Boards and to share within your networks.